Founded in 1993 by NFL Hall of Famer Steve Young, Forever Young Foundation is a nonprofit 501(c)(3) organization focused on passing on hope and resources for the development, strength, and education of children. The Foundation serves children facing significant physical, emotional, and financial challenges by providing them with academic, athletic, and therapeutic opportunities currently unavailable to them. 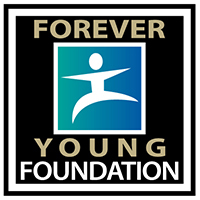 Forever Young Foundation primarily focuses our efforts in Northern California, Arizona, Utah, and Ghana, Africa. Our development projects include Forever Young Zones and 8 to 80 Zones, which provide technology and multimedia labs for those living in underserved communities as well as state-of-the-art interactive play areas in children’s hospitals. Our newest initiative, Sophie’s Place, provides dedicated music therapy facilities in children’s hospitals. These special spaces care for young people suffering from pain, chronic illness, and serious injury. Our international initiatives include the building and expansion of schools in Ghana, Africa, as well as enhancing health, educational, and athletic opportunities for Ghanaian youth. We also devote significant time and resources supporting other remarkable nonprofits through our Nonprofit Institute, GIVE Conferences, and grant making. Steve Young’s fifteen-year career in the NFL was marked by a consistent standard of excellence that came from his own drive for self-improvement, to be a little bit better every day than the day before. Always someone to help his fellow man and to celebrate those who did the same, he brought that same ethic to his charitable giving, eventually resulting in the creation of the Forever Young Foundation, which he co-chairs with his wife Barb. All members of the Board of Trustees have full voting privileges.